The International Manufacturing Technology Show, opened this morning to record numbers: 1,424,232 sq. ft. of exhibit space and 2,123 booths representing 2,563 exhibiting companies. Exhibitors have brought in more than 55 million lbs. of machinery on 4,465 trucks with eight machines weighing more than 100,000 lbs. As of Sept. 7th, the number of pre-registered visitors exceeded 113,000, which is also on pace for a possible record. IMTS 2018 runs from Sept. 10 – 15 at Chicago’s McCormick Place. IMTS 2018 – The International Manufacturing Technology Show recognizes the critical role job shops play within the manufacturing industry. To help job shop stakeholders find solutions to their everyday problems, IMTS 2018 has announced a focus on job shops and created a special series of events, including practical learning sessions, engagement opportunities and conferences. IMTS 2018 runs from September 10 – 15 at McCormick Place in Chicago. To register and learn more about events that help job shops improve efficiency in multiple areas, visitimts.com/jobshops. As an incentive to attend these events, IMTS is offering a chance to win a garage shop welding and cutting equipment package valued at approximately $5,000, courtesy of ESAB. This year, IMTS will host practical learning sessions and conferences specifically geared toward owner-operated job shops from Wednesday, Sept. 12 thru Friday, Sept. 14. The first session and lunch will kick off Sept. 12 at 11 a.m. with insights from marketing master Steve Miller, who will discuss new ideas for business growth and lessons from his book, Uncopyable: Creating an Unfair Advantage Over the Competition. This session and lunch will also be offered on Friday, Sept. 14 at 11 a.m. Following lunch, at 12:45 p.m. on Wednesday only, a panel featuring successful job shop owners will lead a discussion titled The Unending Search for Qualified Labor, the leading issue facing job shops. Another practical learning opportunity at IMTS 2018 includes Modern Machine Shop magazine’s Top Shops Workshop, a live extension of their benchmarking program for job shops, on Thursday, Sept. 13. Top Shops features a combination of technology utilization and modernization that have helped manufacturing facilities be competitive, innovative and profitable. IMTS 2018 features 10 technology pavilions, all offering a multitude of technologies and new products specifically for job shops. From Additive Manufacturing to Metal Cutting to Quality Assurance, attendees will experience new technologies and products for job shops throughout McCormick Place. In addition, the Modern Machine Shop Top Shops Booth at IMTS 2018, located at the entrance to the North Building, provides an interactive display for discovering the best practices of the finest advanced manufacturing shops and plants. During the Job Shops “lunch and learn” events, offered Wednesday, Sept. 12 and Friday, Sept. 14, IMTS encourages shop stakeholders to share ideas and talk through strategies essential for helping their business grow. The chances are that others in the room face the same or similar challenges, and the willingness to share success stories is one of the traits that brings the manufacturing community together. Similarly, the Top Shops Workshop is sponsoring a networking session on Thursday, Sept. 13, from 4:30-5:30 p.m. for all attendees of this program to meet the speakers and engage with industry peers to exchange ideas, share challenges and find solutions that can boost their business to new heights. “If we bring back one or two things that improve efficiency as a result of visiting IMTS, we get paid back tenfold,” says Mike Haupers, founder of Swiss Precision Machining (SPM). A 138-person company located in the Chicago suburb of Wheeling, SPM plans to send 25 to 30 to IMTS 2018. Terry and Molly Keene own Tek Manufacturing, a Spokane, Washington, company with 11 employees, seven CNC machines and 6,000 square feet of floor space. They see IMTS as a true resource for their business. “It’s a great investment of our time and money,” says Molly. “We spend time with people who can further our business. It’s hard to beat a face-to-face, one-on-one conversation with an expert in that field. “The information we gather at IMTS gives us the knowledge to make parts less expensively and meet the quality requirements our customers need. As we invest in more high-tech equipment, our capabilities become greater and it opens up doors for us,” Terry adds. Julie Hoban, CEO of JTD Enterprises, a 20-person job shop in Chilton, Wis., adds that attending IMTS can be an important way to get employees more invested in their work and inspired by new technology. The largest and longest running manufacturing technology trade show in the United States is held every other year at McCormick Place in Chicago, Ill. IMTS 2018 will run Sept. 10-15. IMTS is ranked among the largest trade shows in the world. 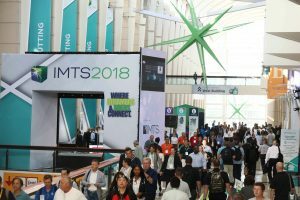 Recognized as one of the world’s preeminent stages for introducing and selling manufacturing equipment and technology, IMTS attracts visitors from every level of industry and more than 117 countries. 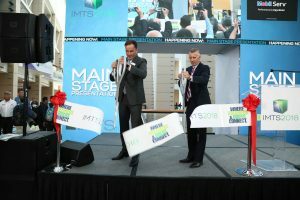 IMTS 2016 was the third largest in number of registrations (115,612) and in net square feet of exhibit space (1,370,256). This show hosted the highest number of exhibiting companies ever (2,407). IMTS is owned and managed by AMT – The Association For Manufacturing Technology. AMT represents and promotes U.S.-based manufacturing technology and its members—those who design, build, sell, and service the continuously evolving technology that lies at the heart of manufacturing. Founded in 1902 and based in Virginia, the association specializes in providing targeted business assistance, extensive global support, and business intelligence systems and analysis. AMT is the voice that communicates the importance of policies and programs that encourage research and innovation, and the development of educational initiatives to create tomorrow’s Smartforce. AMT owns and manages IMTS — The International Manufacturing Technology Show, which is the premier manufacturing technology event in North America.